Tabletop Tuesday over at A Stroll Through Life. Come on over and visit awhile! 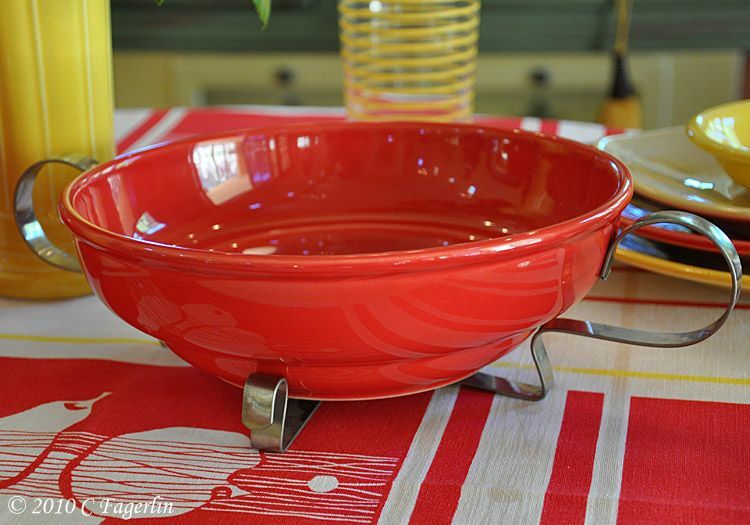 include the shaker from the "pasta" set and an example of the "Betty Bowl". Betty Bowl on prior posts. 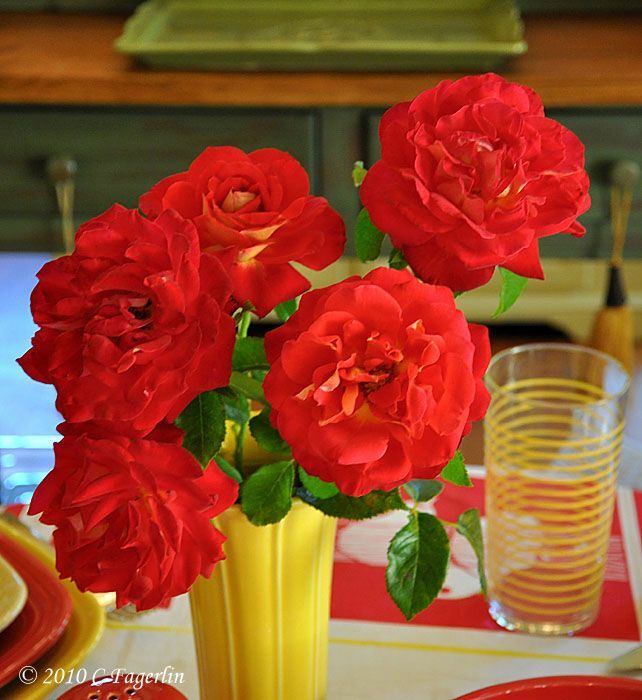 The vase is vintage Fiesta in Yellow, the roses are 'Gypsy Carnival' from my garden, vintage flatware is Deauville, glasses from Target, napkins and candle holders from Home Goods. 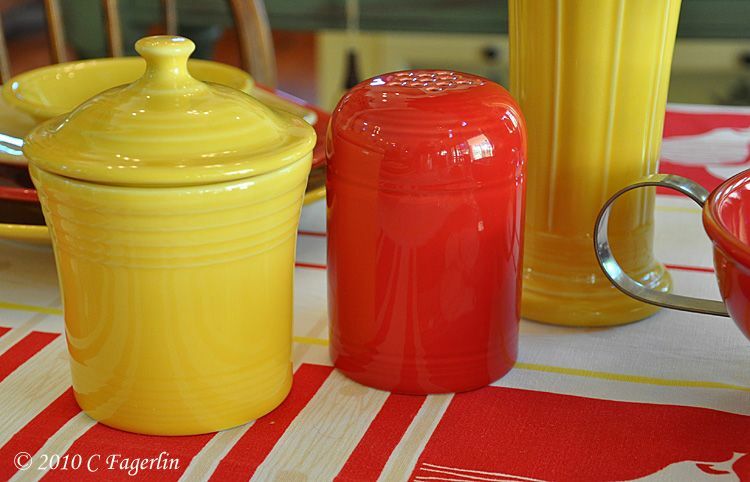 The recently released Jam Jar is shown in Sunflower on the table and in the rear in Scarlet, Tangerine and White. Just too cute! Thanks so much for stopping by and Happy Tabletop Tuesday! I just found your blog for the first time. What an amazing kitchen you have. 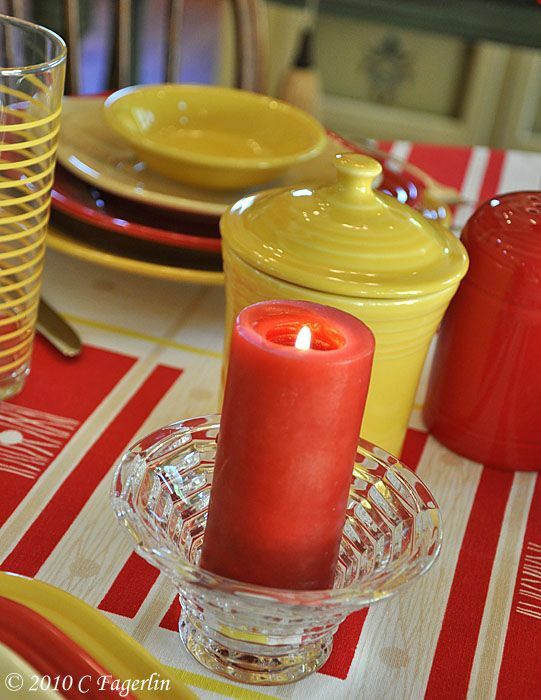 The tablescape of course is delightful as well. Now I'm going to have to spend some time perusing through the rest of your blog...So glad I found it. 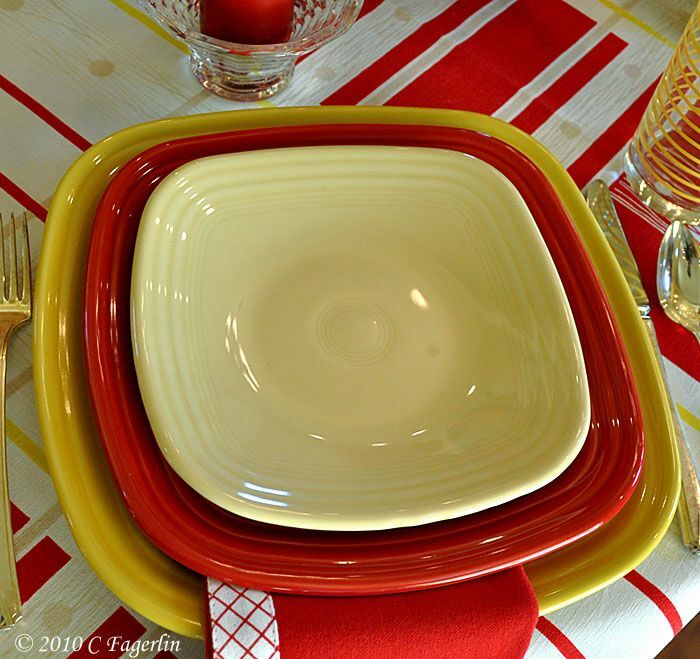 Love your dishes and the table setting and WOW! your kitchen is just incredible...so beautiful. love your style! You have my dream kitchen. I love, love, love it. I don't think I have seen it before. 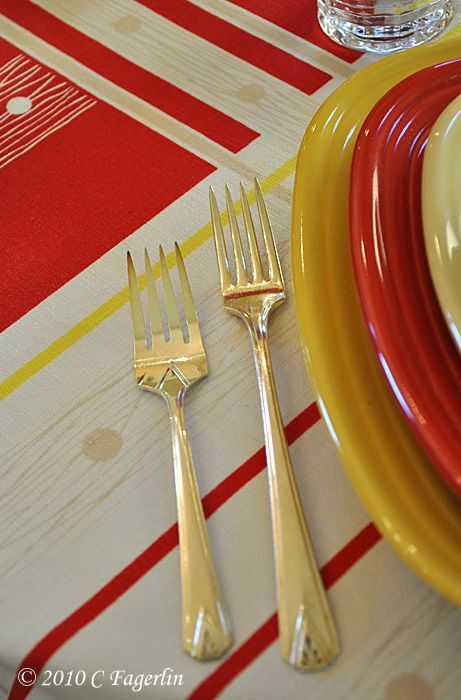 Love your tablesetting. Those dishes would be perfect in my breakfast room, too. O.K. I am going to continue to drool over your kitchen now. 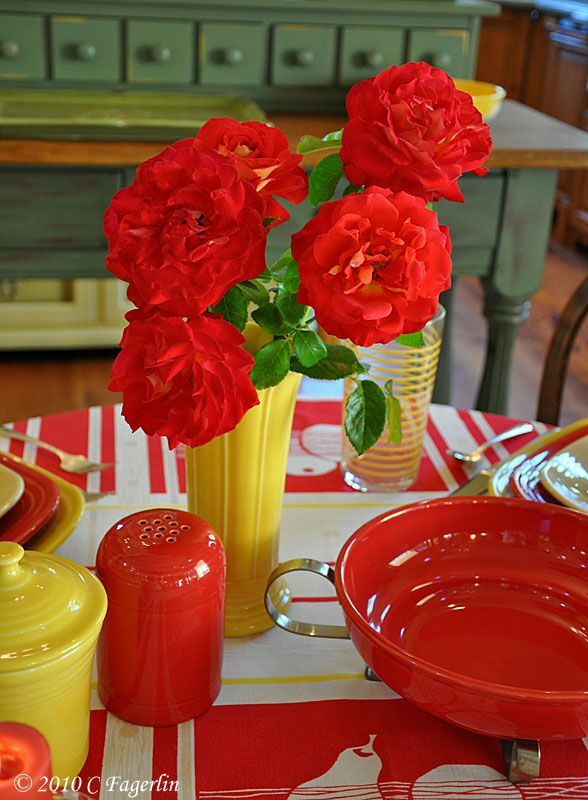 What a delightfully charming summer table. Very lovely. 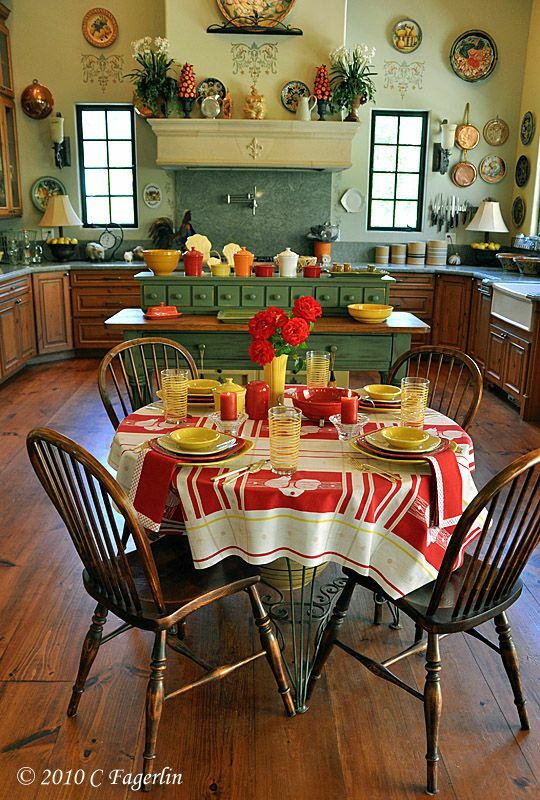 Love your kitchen as well, very tuscan looking!! The colors look great together and I love the Betty Bowl. You have a lovely kitchen! 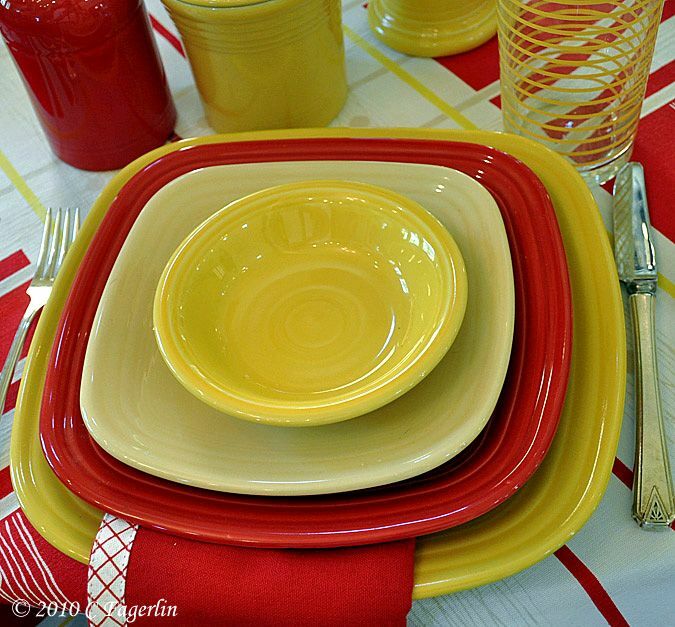 Oh, I love the red and yellow. It is so darn cheery that it would be difficult to have a moody day. 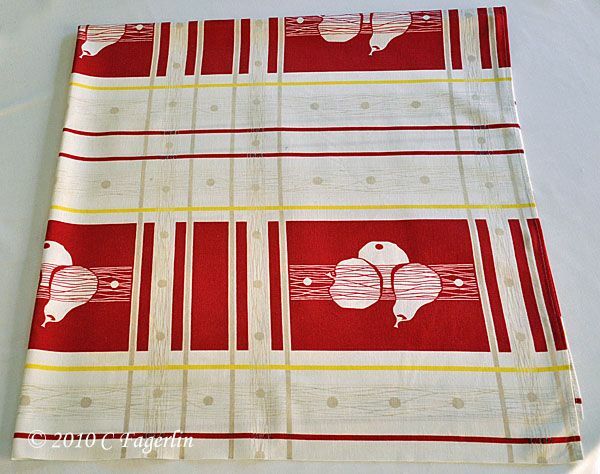 That is a vision of vintage loveliness! 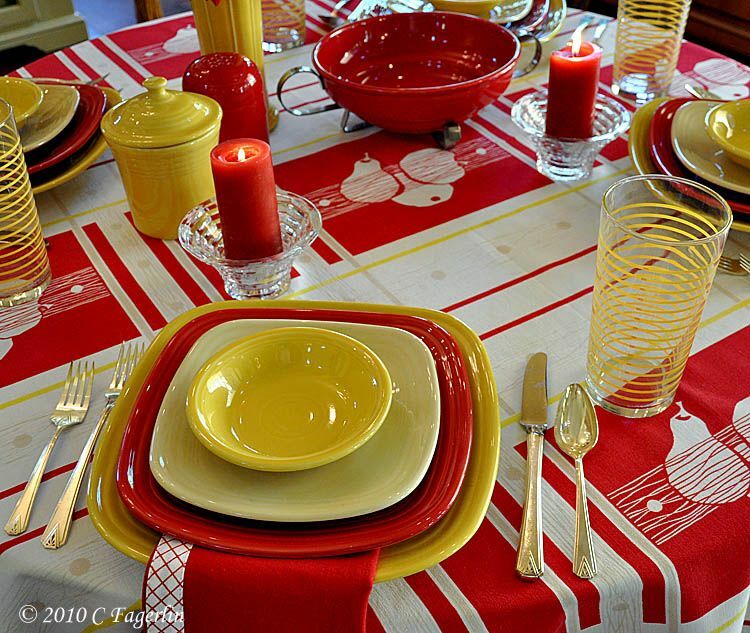 Beyond gorgeous with those reds and yellows! I just found your blog and love it!! 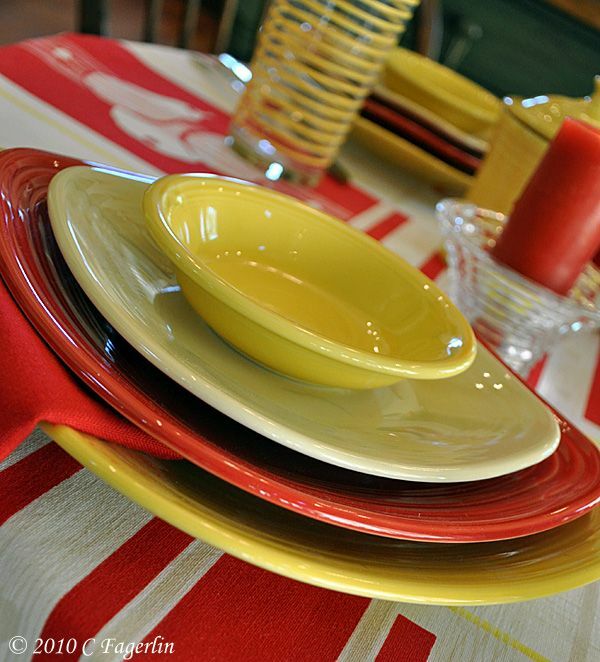 I am a huge fan of Fiesta ware. I bought my first piece about 15 years ago and was hooked. I have about 25 pieces. What a pretty table! 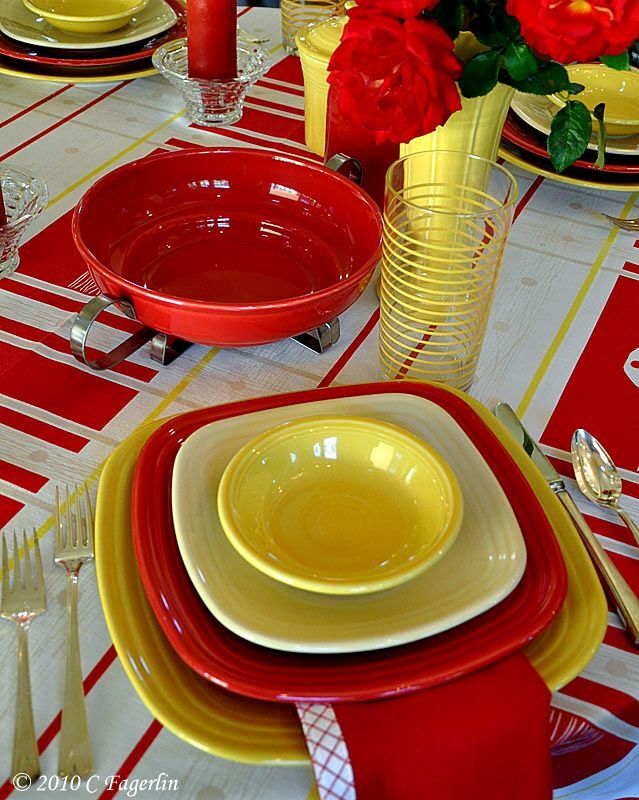 The colors remind me of mustard and ketchup, and even hot dogs would taste good in such a cheery setting. Good Morning, Candy! I'm popping by from Marty's TTT linky party. Oh my! 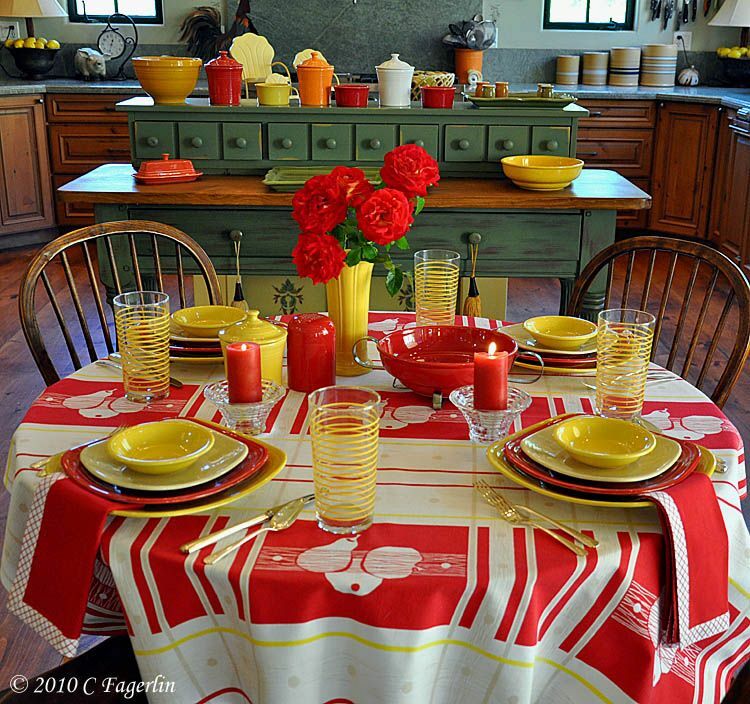 Your kitchen is fabulous, and your tablescape is just wonderful. This is my first visit to your blog, and I can't wait to check out more. 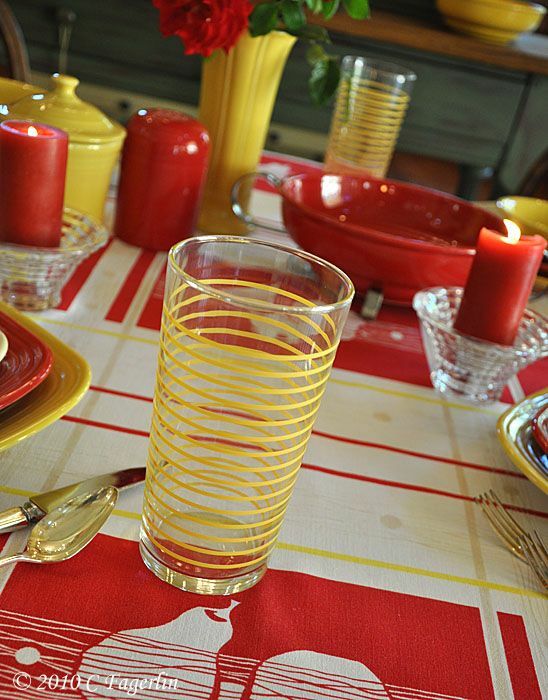 Love the color combination of red/yellow. Reminds me of my laundry room. 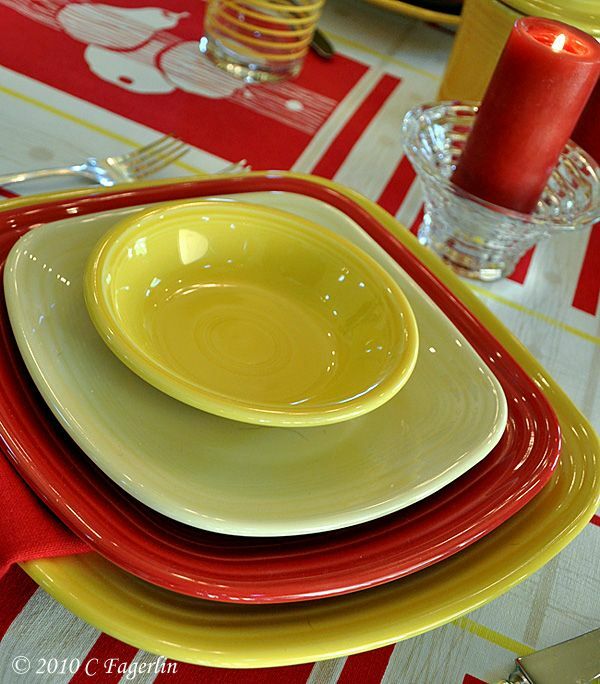 The dishes are so fun and colorful. I want those glasses, too! Are they a recent Target purchase? 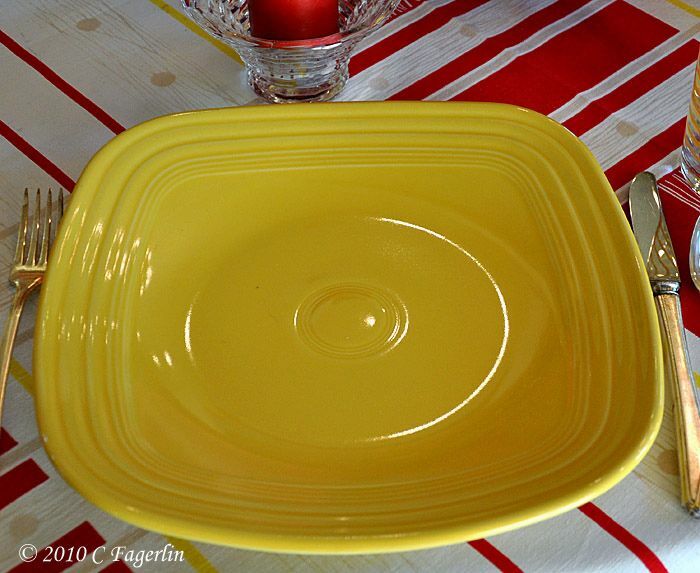 Thanks for sharing your table setting. And welcome to Nita! Hope you come back soon. blue moon - Too funny, I just stopped there this morning before hitting Costco ..... just my luck they were CLOSED!! Say what??? They had Dr appointments and they closed for the day! I may see if they are well enough to open the store tomorrow, cause I forgot a bunch of stuff at Costco anyway and they had these huge glazed planters that I am punching myself for not getting. 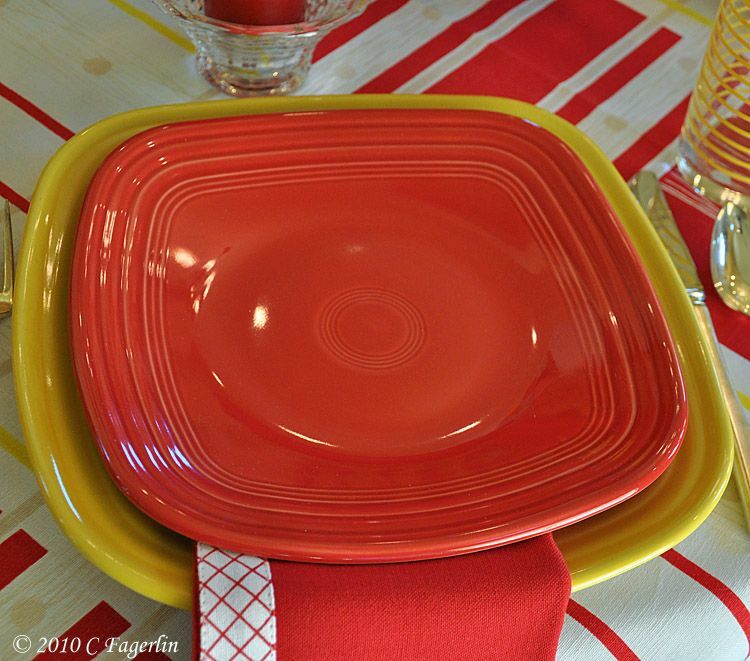 See you all again soon I hope, another tablescape coming up around 6PM today for Tablescape Thursday!